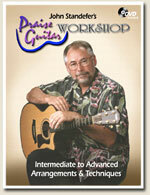 Designed originally for alumni of John's Praise Guitar Workshop weekend seminars, this video & book set picks up where the live workshop left off with 15 exciting accompaniment and solo arrangements of hymns, choruses and songs. You'll learn lots of new ways of approaching Christian music through arrangemnets that are loaded with cool chords, exotic rhythms, licks and tricks! Learn to read TAB more effectively using John's visually intuitive 'Picture-Perfect' TAB (also used in his 'Favorite Solos' book from Mel Bay). Take the ho-hum out of hymns and add punch to praise choruses while introducing fresh new worship songs to your church! Newly revised book includes 76 minute video.